Disney World is a crowded place. There’s no getting around that fact, and really, it makes sense that it’s crowded. After all, who wouldn’t want to see the most magical place on earth? But with these tips for avoiding crowds at Disney World you will be skipping through the park. All those crowds can really put a damper on your fun. Bigger crowds mean less visibility at parades and shows, longer lines for rides and food, and more obstacles when going from one place to the next. Fortunately, there are some things you can do to avoid the biggest crowds at Disney World. Try these trips for a less crowded and less hectic Disney trip. Truthfully, no season is slow at Disney. That said, there are some times of year that are slower than others. Most of January and February (avoid Presidents Day), late August, September, and weekdays in October and early November are all ideal. By visiting during one of these times, you’ll avoid the bigger crowds and the bigger costs. Making good use of the FastPass+ system won’t make the crowds any smaller, but it will make them seem less irritating by significantly reducing the amount of time you spend in line. To get the most out of this system, use your FastPass reservations on the attractions with the longest wait times. You should also grab a fourth FastPass as soon as your third one has been scanned, then a fifth one as soon as the fourth has been scanned, and so on. Guests who choose to stay in a Disney World hotel will have access to Extra Magic Hours. Extra Magic Hours are an extension of the normal park operating hours during which only Disney resort guests may be in the parks. These occur just before the usual park opening time or just after the normal closing time, and are almost always less crowded than other times of day. All of the Disney parks are relatively slow in the early mornings. Therefore, by arriving half an hour before opening time, you can enjoy a couple hours of shorter lines before the masses come pouring in. Just be sure you don’t try this trick on a day the park you’re visiting has morning Extra Magic Hours. Afternoons are the most crowded time at any Disney park. Avoid this crowd-heavy time of day by taking a midday break. Head back to the hotel, go for a swim, and take a nap. By the time most park goers are worn out, you’ll be ready for another round. Because most Disney guests have children, the crowds tend to thin out later in the evening. Use this to your advantage by staying until park close. Those late night hours are when my family has experienced some of our most magical visits. Disney World restaurants can get quite full during normal meal times. In quick-service restaurants this can mean long waits in line at the register. Meanwhile, table-service eateries may leave you waiting in the lobby for a table long after your reservation time. Both of these scenarios can be easily avoided by choosing to eat your meals at odd times. For instance, you might choose to have brunch instead of both breakfast and lunch, and then eat an early dinner. You can always have a late night snack at the resort if you get hungry. Another great way to avoid long lines at quick-service locations is to make use of the mobile ordering system Disney has put in place. This is super easy and can be done in the My Disney Experience app. Order while you’re in line for a ride and pick up when you walk off! As I pointed out in my Disney in the Rain article, it rains quite often down in Orlando. Often, this clears the parks out quite a lot, meaning lines will be shorter and pathways will be nearly empty. If it rains during your trip, take advantage of the downpour by sticking around and enjoying some of the many indoor attractions. During the holidays, Disney hosts hard ticket events such as “Mickey’s Not So Scary Halloween Party” and “Mickey’s Very Merry Christmas Party”. A relatively small number of tickets are sold for these parties, meaning you can experience Magic Kingdom with far fewer visitors and much more entertainment. 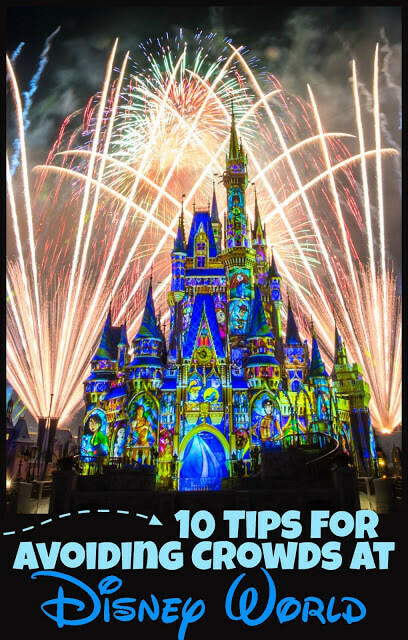 These are my top tips for avoiding crowds while visiting Disney World. While using these tips won’t necessarily guarantee you never have to wade through a post-fireworks crowd, it will almost certainly make your visit a whole lot easier and more laid back.